Neo Blythe is a fashion doll that her head is about the size of a grapefruit with slender body. She always dress up with clothes especially made for her. When you pull the string at the back of her head, her eye colors and eye direction will change and this changes her face expression totally. When her eye color and direction change, she looks almost like a different doll. Blythe is very popular from her high fashion sense, which makes her become a presenter or model for many magazines or advertising. Women from all around the world love Blythe because Blythe fashion always reflects the fashion trend at the moment. There are 3 types of Blythe doll Neo, Petite, and Middie. Neo Blythe is 28.5cm tall, Petite Blythe is 11cm tall and Middie Blythe is 20cm tall. Their special gimmick is the eyes those can change direction in different ways according to different mechanism in each type of dolls. Manufactured by Kenner in 1972, the original Blythe (now known as “vintage”) was produced for only one year and then was retired because of poor sales. 30 years later, in 1999, Junko Wong, President and CEO of CWC saw Blythe snapshots at the CWC New York office opening party. 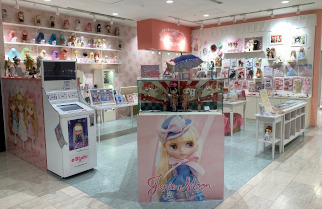 She fell in love with Blythe and knew she would be an instant sensation in Japan. Then, in late 2000, she made her comeback in Japan when CWC produced a charming TV commercial for Parco department store starring Blythe. After the TV spotlight she became an overnight sensation in Japan and Asia. Neo Blythe was reborn, no longer as a child’s toy but as a fashion doll appealing to adult doll collectors. Neo Blythe ushered in the era of contemporary doll culture and collecting. In June 2001, to meet the popular demand of this new Blythe fan base, CWC produced an 11 inch neo-Blythe doll, Parco Limited Edition, with the permission of Hasbro and the manufacturing help of Takara. This was the very first Neo Blythe doll. ＊The first designs for Neo Blythe were inspired by the Kenner Vintage Blythe designs. 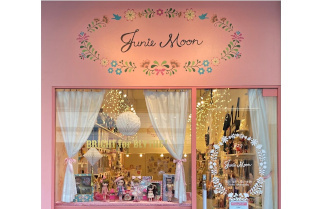 Later on Neo Blythe was produced with original concepts and designs by the CWC design team Junie Moon. From 2001 to 2011, CWC produced and planned the Blythe Anniversary Charity Event and exhibition. This anniversary extravaganza featured one-of-a-kind Blythe dolls customized and styled by famous fashion designers, artists and musicians. The anniversary exhibitions travelled throughout Japan, Asia, and even Europe. The dolls were then auctioned off for charity with 100% of the proceeds going towards charity. Blythe supported numerous charities throughout the world. These anniversary exhibitions dolls garnered media attention and the attention of collectors and customizers creating a sensation in the doll world. In 2002, Neo Blythe’s cute little sister, Petite Blythe was produced. She measured 11 cm and was a sweet addition to the Blythe family. In 2005, Blythe figurines were produced. In 2010, a new 20 cm medium sized Blythe doll was produced. Middie Blythe is the lovely adolescent sister to Neo and Petite. Until 2011 there are 185 types of Neo Blythe, 200 styles of Petite Blythe, and 5 Middie Blythe created in Japan. For a complete history of CWC produced Blythe dolls, please take a look at the Blythe Collection Guide Book (3,150 JPY, published by CWC Books and sold by Graphic-Sha Ltd.) released in January 2012. This book has details of all of the Blythe dolls released until December 2011. This is a must have item for all Blythe collectors. Junko Wong is the CEO and President of Cross World Connections Group and Blythe Creative Producer. She had the unique vision to bring back Blythe. She is in charge of all promotion plans, marketing, production, doll concepts and designs. She has experience in various types of projects such as freelance exhibition producer and curator. Junko established Cross World Connections co.,ltd in 1991. CWC holds contracts with world’s top illustrators such as Jeffrey Fulvimari and about 40 artists from around the world. CWC is a creative agency for illustrators, character designers, and graphic artists. From 2000, CWC was granted the Blythe license for Japan and Korea and started the total creative production for Neo Blythe. CWC created all Blythe products such as Blythe dolls, stationery, Blythe related product plans, designs and as well as animations. 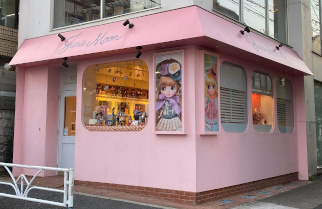 Mrs.Wong is the leader of the whole CWC group, CWC retail division Junie Moon co.,ltd (official shops in Daikanyama and Shinjuku Marui One Lele Junie Moon), and also CWC International a worldwide artists agent New York branch. Blythe logo, image, and copyright is the intellectual property of Hasbro co.,ltd USA. The use of Blythe image or logo without permission from Hasbro co.,ltd or Cross World Connections co.,ltd (CWC) is prohibited. Hasbro co.,ltd granted Blythe license to CWC for Japan and Korea. CWC has the license for Blythe doll creativity, production, model and business license. Any company or individual person can not use Blythe logo, word or Blythe image to manufacture goods, selling, advertising or event promotion. An individual person can use Blythe photograph for personal use. 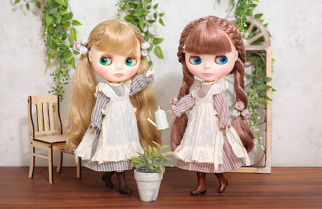 However the usage of Blythe photos, words, phrase, designs from CWC official website, promotional e-mails or any material made by CWC is completely prohibited. Blythe fans wishing to organize a Blythe event for fans, please contact us in advance. CWC has to be very strict on the copyright matters since we are the license manager. However, we will do our best to cooperate with events those get official permission from us. These conditions are presented by Hasbro co.,ltd who has the whole license of Blythe. Since CWC is the license manager, we need to ask everyone to follow these rules. Any unauthorized use of Blythe can interrupt Blythe production and sale. Your understand and cooperation are highly appreciated.